Cali Thornhill DeWitt, Inhabitants, 2019 (Inkjet and acrylic on canvas, 183 cm). BEASTS CREEPS MEN GHOULS VAMPIRES WOMEN GHOSTS - the words are painted in bold capital letters in black, florescent pink and orange, circling a spectacular image of the earth seen from space on a large circular canvas (Inhabitants, 2019). The words seem to encompass the planet in an ominous manner, predators circling prey, a universal warning sign to potential extraterrestrial visitors: This is what you are going to find on this planet. In his solo exhibition WAR SONG, DeWitt appropriates and detours the global sign language we normally navigate intuitively. Semantics are hijacked and recontextualized in order to question the logic of language and human behavior. A circular canvas with an image of the earth on it, has a bright orange X, painted across the planet, in each leg a word, together they spell: MUTILATED LANDSCAPE (2019). The work reads like a warning not to cross the orange line for safety reasons â€“ hazard ahead â€“ which communicates well, until you realize that you live on the wrong side of the bright orange X.
Cali Thornhill DeWitt, Mutilated Landscape, 2019 (Inkjet and acrylic on canvas, 122 cm). With this new powerful body of work, Cali Thornhill DeWitt steps directly and clearly in to the Anthropocene. We are changing the planet with unprecedented acceleration and in the wake of this change we find ourselves in uncharted waters and a swamp of dilemmas. Human behavior and our all-consuming consumer philosophy are destroying our natural habitat, while the first fake philanthropists and neo-colonizers scramble for new settlements off earth. 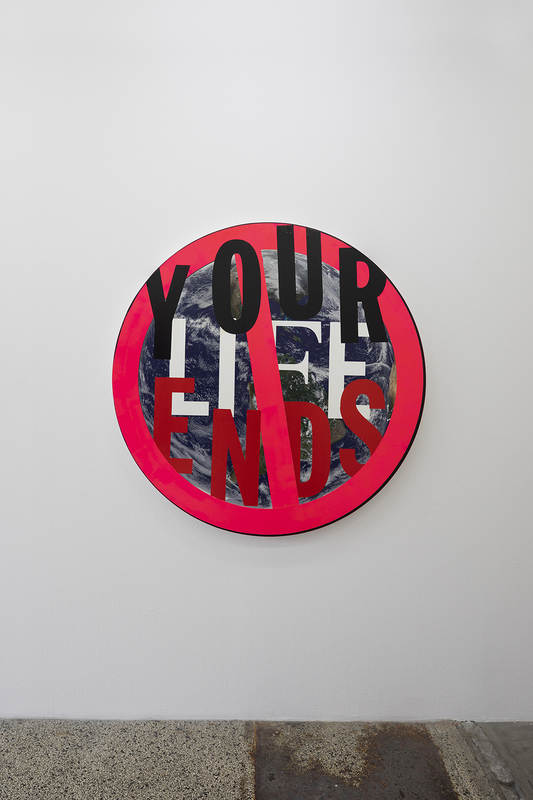 Another circular painting adopts the â€œdo notâ€� crossed circle motif, the earth is almost blocked out by the words YOUR LIFE ENDS (2019). In narcissistic confusion you are struck by the obvious â€“ my life ends? here the good news is yes â€“ but how will the planet fare? Will it survive? Probably, but maybe not in a condition suitable for humans. The aesthetics of WAR SONG are familiar and radical at once. The earth images on the canvases are clear and crisp, laser printed with fine art ink, and the words are painted by hand on top, leaving the traces of human labor. The concrete sculptures that are found throughout the exhibition, mimic the concrete blocks we see every day, fencing in construction sites around the world, keeping us out, or somebody in, barriers serving a simple purpose. (Iinkjet and acrylic on canvas, 61 cm). (Inkjet and acrylic on canvas, 122 x 91,5 cm). In DeWittâ€™s versions, the custom-made concrete barriers disturb the logic with two-sided statements stenciled across them: ENDLESS WAR / HOWLING LAUGHTER, WORLDâ€™S LARGEST / GARBAGE DUMP. Duality and transformation are at the core of Dewittâ€™s practice in both concept and materiality - and so it is with the legibility of the works. Seeing an image of the earth from space - our home, our history and our possible future, is an event that will make any human momentarily breathless, so few of us has witnessed this view in person, but we all recognize it, it is our DNA. These images joined or juxtaposed with the lyrics of now, makes for a poetry of the real. A War Song. Cali Thornhill DeWitt, WarSong. V1 Gallery, 2019. Photo by Jan SÃ¸ndergaard. Cali Thornhill DeWitt, WarSong. V1 Gallery, 2019. Cali Thornhill DeWitt (born 1973, Vancouver Islands, Canada) lives and works in Los Angeles, USA. Dewittâ€™s practice reflects and comments on a complex and fragmented world and existence, but instead of fostering first world apathy or nihilism, it induces curiosity, defiance and thought. Working in the tradition of Jenny Holzer, Barbara Kruger, John Giorno and the late great Mike Kelly, DeWitt is a multidisciplinary artist and cultural engineer. Recent and ongoing collaborations include Varg (album covers) Kanye West (Pablo World), Iceage (videos, album covers), A Four Labs (two collections), Someware (a collaboration with artist Brendan Fowler) and numerous projects with Haruka Hirata of Big Love. 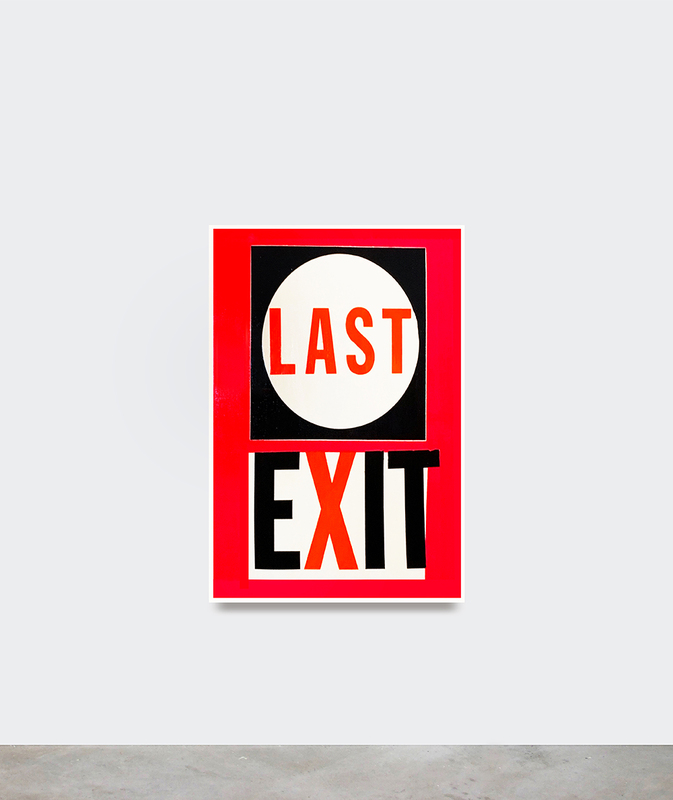 DeWitt has published numerous artist books: Let Me Crash Here For A Moment, 2018, Violent Music, 2018, 29 Flags, 2017, Manhattan, 2017, First Show, 2017, Over The Volcano, 2016. A new publication will be available in conjunction the opening of the exhibition. WAR SONG is Cali Thornhill DeWittâ€™s third solo exhibition with V1 Gallery & Eighteen. Opening reception: Friday April 5, 2019. From 5pm-9pm. Opening hours: Wednesday-Friday: 12-18. Saturday: 12-16. Or by appointment.